Wait, how the hell does she expect to be a professor here? Because I really hate it when people assume that because you are good at something, you are automatically good at teaching and explaining it. From what I’ve heard talking to people in science programs, the professors are often selected more based on ability to attract research grants than how good they are at teaching. Teaching Assistants often do more of the ‘teaching’ than the professor ever will. It varies based on the college. I had some profs who were definitely “am I not getting it or are they not explaining it” but my college also had a physics professor who was a master at pitching the subject matter to the ability level of the class. His textbooks actually sounded conversational, would take you through the thought process of approaching the subject instead of “it’s easy to see that this leads to” or “the reader can show” (which like horse racing is code for “you’re getting a C”) and are such a departure from standard physics textbooks that it was horrid going back to them. Don’t they usually make at least some pretense of being an educator? And it isn’t as if Paladin needs the professorship or grant apparat, she gives off the distinct aura of a budding Tony Stark. Unless she’s useless like Reed Richards. It depends on professors, but certainly some of them are more focused on teaching, and some are more focused on researching. I think it makes sense to have both – universities are research institutions, after all, as well as educational ones. Even if Paladin doesn’t need grants, being at a university puts her in contact with a wider group of researchers, and enables a range of interdisciplinary conversations (some kind of “ethics in robotics” working group, with a mix of teachers – some versed in psychology, some in philosophy, some in computer science and robotics – would be great). As a student in Biochemistry, yeah, the TA’s teach you a lot more. Professors lecture for sure, but some of them might even get annoyed if you show up for office hours. I go to a research university though, and don’t speak for everyone. BTW, the irony that I missed yesterday is that this is supposedly the New School? The real-world New School is a liberal arts/social sciences college, which doesn’t offer any serious science or engineering degree programs. Seriously, the closest they come is a masters program in environmental policy or a BA program in “interdisciplinary science”. They should have absolutely *zero* engineering/physics/compsci research-track professorates. All their “technology” programs offer bachelors of fine arts degrees! She’s planning on being a research professor, most likely. They accepted Allison because she’s Mega-Girl, and fired a professor because he gave her a bad grade. Her university is collecting celebrities for the prestige. Now they can get one as faculty instead of just as a student. Sounds like the perfect time to build an Independent Pedagogical Automaton Division of super teachers to inform the world! I thought Alison only needed a professor to sign off on it, not to actually teach her anything. Paladin being a crummy teacher shouldn’t matter either way. Unless of course Alison actually wants to learn something. That’s all well and good, except Alison wants to learn “Solving all the Worlds’ Problems”, and Paladin (supposedly) teaches “Robots and maybe Advanced Physics”. 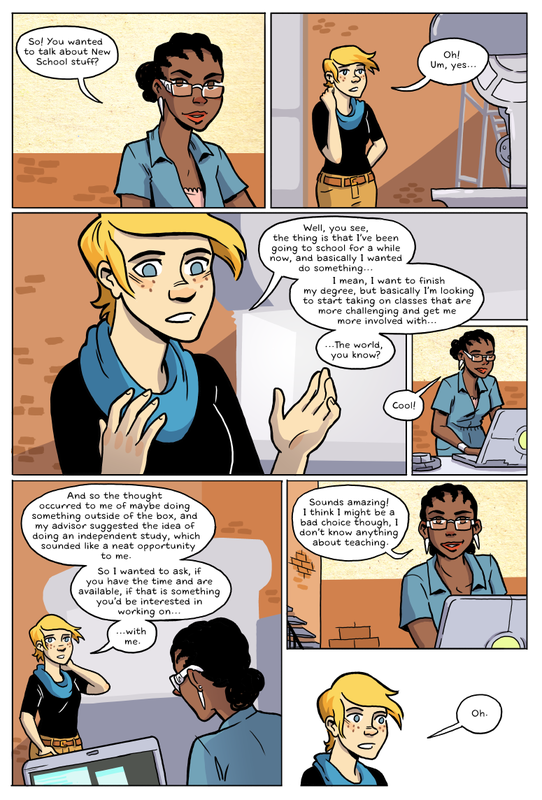 Alison is (or at least was) going to a friendly Hard Science professor to sign off on her vague Soft Science project. Which is completely fine, since it’s just a bureaucratic formality. Paladin being the worst teacher outside of a Jack Chick tract wouldn’t matter at all since Alison (probably) isn’t going to try to fix the planet with an army of robots and particle accelerators. Well, that certainly seems to be an issue. Well she better learn about teaching soon. Doesn’t matter how many super villains you’ve punched in the face if you can’t get your students to understand the material. Wait, did she read the last panel…y’know, the one where she was teaching? After the last few comics, Lisa’s selling herself way short here. Even if she’s not, this could be a learning opportunity for both of them–Alison would benefit from Lisa’s interdisciplinary perspective on society, and Lisa would get to hone her teaching skills.